Federal spending on children will continue its expected decline, falling to roughly 7 percent of outlays and less than 2 percent of the economy by 2028, according to the 2018 report from the Kids' Share project at the Urban Institute released last week. The report also confirms several projections from our recent paper, Budgeting for the Next Generation: How Do Kids Fare?, including that spending on interest on the debt will exceed spending on children within just two years. In 2017, the federal government spent $375 billion on children younger than 19. Along with $106 billion in tax reductions for families with children, resources for children totaled $481 billion. Spending on children made up about 2 percent of gross domestic product (GDP) in 2017 and is projected to decline further to 1.6 percent by 2028. Total support for children, an amount that includes tax provisions designed to support children, would fall from 2.5 percent of GDP in 2017 to 2.1 percent by 2028. The children's share of the federal budget is expected to fall from 9.4 percent of outlays in 2017 to 6.9 percent by 2028. Using CRFB's calculations of Kids' Share data, total support for children would drop from 8.7 percent of comparable resources in 2017 to 6.6 percent in 2028. Interest costs are expected to exceed spending on children by 2020, and interest payments will more than double in dollars within a decade. The results of the report were released at an event hosted by the Urban Institute on July 18. Maya MacGuineas, president of the Committee for a Responsible Federal Budget, was among the panelists who weighed in on the latest numbers and discussed how the current political climate and budget process favor policymaking that is more focused on the short term than the long term, which leads to children becoming a lower priority in the federal budget. Kids' Share 2018 shows that health care and tax provisions, both in the form of refundable tax credits and tax reductions, dominated the sources of federal support for children in 2017. Nutrition programs, income security programs such as Social Security and Temporary Assistance for Needy Families, and education also contributed significantly to support for children. As a share of the budget, Kids' Share 2018 shows that the federal government devoted even less to children in 2017 than 2016. While a decrease was expected, the updated numbers also show that investment in children captured a slightly lower level of federal and economic resources last year than previously estimated. End-of-the-decade projections, which are based on current law assumptions that recent tax cuts and discretionary spending increases will expire, are also lower than prior projections. Kids' Share 2018 shows that spending on children dropped from 9.8 percent of the budget in 2016 to 9.4 percent in 2017, rather that the 9.6 percent previously estimated for 2017. Using CRFB calculations of Kids' Share data on tax resources, total support for children dropped from 9.4 percent of comparable tax and spending resources in 2016 to 8.7 percent in 2017, rather than the 9 percent previously estimated for 2017. By 2028, Kids' Share projects that the federal government will spend just 6.9 percent of outlays on children, and extrapolating that data shows that support would fall to 6.6 percent of comparable resources. 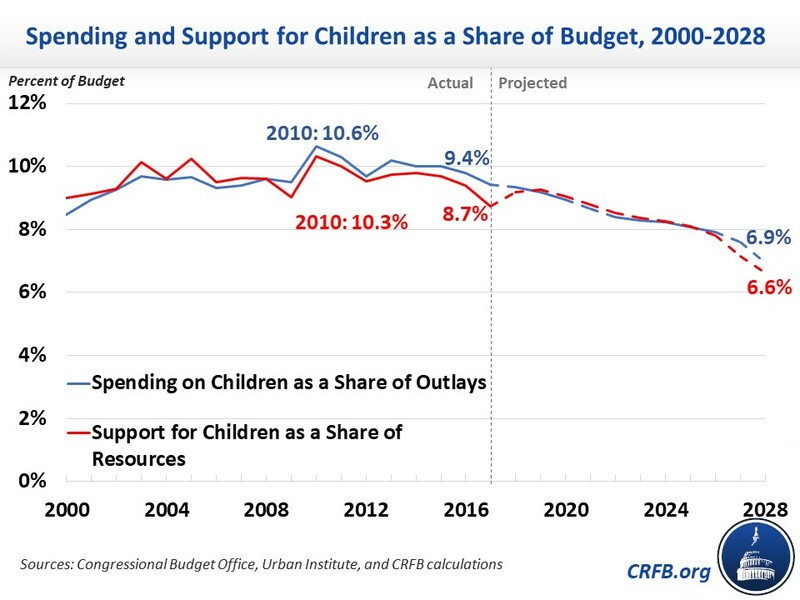 CRFB previously projected that spending on children would make up 7.4 percent of the federal budget by 2028 and that total support for children would make up 7.0 percent of comparable resources by 2028. Although spending on children stayed roughly level as a share of GDP between 2016 and 2017, it is projected to drop in the years to come. By 2028, Kids' Share projects that the federal spending on children would further fall to 1.6 percent of GDP and total support would fall to 2.1 percent of GDP. 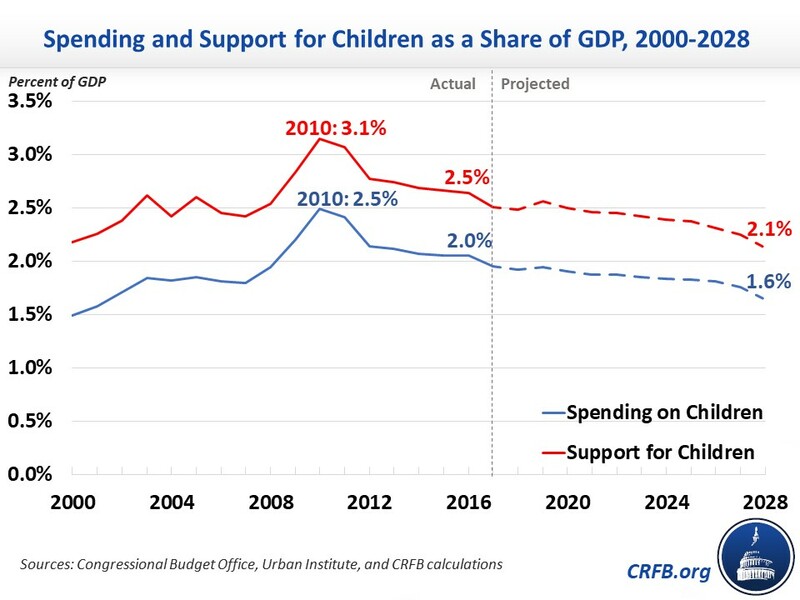 CRFB previously projected that spending on children would make up 1.8 percent of GDP by 2028 and that total support for children would make up 2.2 percent of GDP by 2028. The 2018 Kids' Share report notes that recent tax and spending bills will temporarily increase expenditures on tax provisions and keep discretionary spending from falling significantly relative to GDP – both of which contribute to an increase in support for children – but the effect is short-lived. Meanwhile, as we covered in our recent paper, debt will rise to its highest level as a share of GDP since just after World War II, and spending on interest will exceed spending on children every year beginning in 2020. Children will still get shortchanged by the budget even as federal outlays are projected to grow more quickly than the economy, as interest costs and spending on Social Security, Medicare, and Medicaid for adults comprise most of the growth in spending. According to Kids' Share, while 61 percent of the growth in spending over the next decade could be attributed to spending for adults on Social Security, Medicare, and Medicaid, only 1 percent of the growth is projected to go to children. MacGuineas told the audience that underinvestment in children underscores the short-sighted nature of current policymaking and would have eventual consequences for the economy. "I think the role that kids play in the budget actually illustrates so many of the shortcomings we have with the budget right now, and I think the budget illustrates so many of the shortcomings that we have with our ability to govern right now," she said. The trends in federal spending and which demographic groups benefit most from it remain economically backwards, but they will not begin to improve until policymakers start to focus more on the long term. The budget process also plays a role in the disadvantages that programs for children face, and CRFB will explore that issue in future papers for Budgeting for the Next Generation.